Rescatux 0.40 beta 1 has been released. Rescatux 0.40b1 size is about 596 Megabytes. 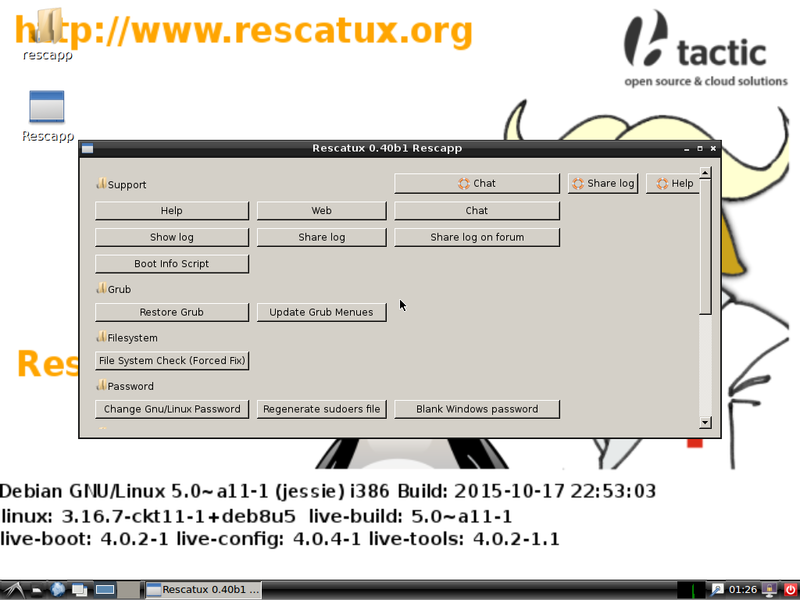 Now Rescatux is based on Debian Jessie (Latest Debian stable release)! The great new feature in this release is the SELinux support. SELinux support is used by the Fedora, Red Hat Enterprise Linux (RHEL), CentOS alike distributions. It’s not so much about adding SELinux related features which might be implemented in a far future. It’s about being able to interact with SELinux based system without damaging original contexts (contexts like additional permissions in SELinux). Currently if you wanted to use the change password option on these systems then the system did not let you login (even if you know a password from a user different from the one its password you had changed) because these wrong contexts. Now it should work flawlessly but please give us feedback here on the comments or in the mailing list. Anything about you detecting that Rescatux is not using the correct contexts for your files is welcomed. It’s also welcomed feedback from people who uses non standard policy types such as the military ones. Given the nature of these systems try the options in non production machines of course. This new beta release loses the long awaited feature about being able to select your own language, country and keyboard. The reason is that Rescatux 0.40 is based on jessie. These means that I have to use tails-greeter from Jessie and not Wheezy. The other problem on tails-greeter is that I need to hack it (this time properly thanks to the insights I have been given in Debconf 15 from Tails people) in order to fit my needs. Finally don’t expect any new release in the next months. I am too busy. Anyway once I’ll start not being busy I will be able to speed a lot because the SELinux support improvement was very difficult to implement. Many options have not been tested after having based Rescatux on jessie. So please use the Rescatux 0.32 beta 3 as if it was an stable release and this one as if it was a beta one. Use Rescatux 0.40 beta 1 if you have a SELinux based system of course. In case you were asking yourself I add 0.1 to the Rescatux version either when the Rescapp program has been improved a lot or when the Debian OS has been updated to a new stable release. The latter is the reason why we jump from 0.3X to 0.4X suddenly. I almost forgot. Thank you very much to the #fedora-devel and #selinux who helped so much on bringing SELinux support to Debian Live. Packages versions for this release can be found at Rescatux 0.40b1 packages.